Sequel of Kung Fu Panda named Kung Fu Panda 2 was released finally. Review Kung Fu Panda DVD and Make Copies for This Amazing Animation movie! 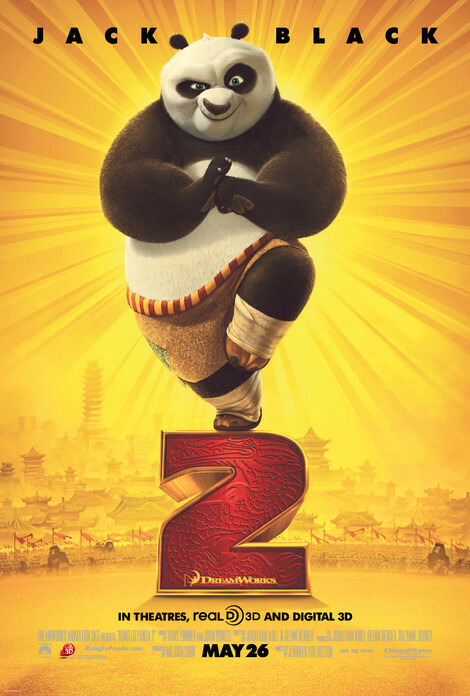 Po, the out-of-shape panda who was improbably tapped to become the Dragon Warrior in the original kung fu panda, is now a well-trained martial arts hero who must defeat a powerful villain armed with an unstoppable secret weapon. Backed up by the Furious Five and his teacher, Master Shifu, Porealizes that to defeat the evil Lord Shen, he must uncover a long-hidden secret about his own childhood and learn to attain inner peace. Angelina Jolie, Jackie Chan, Lucy Liu, Seth Rogen, David Cross, and Dustin Hoffman all reprise their roles asPo’s comrades in this worthy sequel. Kung Fu Panda is pretty standard childhood fare — believe in yourself, family is what you make it, watch out for peacocks. It’s the 3-D animation and provides a better enjoyment than 2D (maybe not correct to each audience, someone prefers 2D, like me). Kung Fu Panda has visual spectacles of fine art and 3d innovation. The humor, too, was enough to keep the audience interested in what the characters were about to say. It talked about redemption, personal life goals, and the realization of self. Review Kung Fu Panda DVD and Make Copies or rip the DVD movie to your protable devices such as iphone,ipad and ipod, etc for This Amazing Animation movie right now!! It is said that the movie is indeed a funny one and able to make audience smile all the time but it maybe not an unforgettable movie. Chances are you will not cherish the movie too long. But who cares? Enjoy the present fun is important, life is too busy and we have too much pressure, why just not watching it without stress and smile, smile and smile? It is not reasonable to tell the movie is worth to watch or not by one person or by some famous film reviewers, since we come from different backgrounds and have different life experiences. Kung fu panda is an animated film, but can not define it is only for children. Some reviews said the movie is not good enough and point out some shortcomings such as the story is not worth to cost such a long time to stay at the cinema. But nothing is perfect and audience will have his own opinions. Or we no need to think that much, just go to watch it and enjoy the funny time with your friends, your families, or even watching it by yourself can be counted as a great idea, too! By the way, I think the Pirates of Caribbean: On Stranger Tides is worth watching in cinema. Even though I heard it is not good as previous3, but I am one of fans of Cap. Sparrow, so I did not hesitate to buy a ticket and sit there to watch and I did enjoy lots of fun from the movie. I also like Capt. Sparrow and Barbosa very much. Their performance is very good! That is also the reason why I advice movie lovers should define a movie is good or bad after watching it by ourselves, not only hearing from others.